An official website launched and announced a new original anime movie by Tatsuyuki Nagai. Titled Sora no Aosa wo Shiru Hito yo (The Person Who Knows How Blue the Sky Is), the movie will premiere in Japanese theaters on October 11. The Ano Hi Mita Hana no Namae wo Bokutachi wa Mada Shiranai. production team will team up again to produce the anime movie. 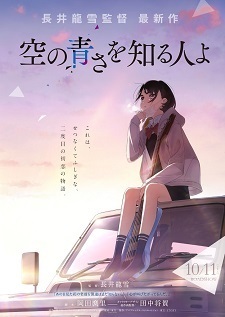 The catchphrase on the key visual reads, "This is a second first love story that is sad and mysterious." Oh boy, the comments in this thread is going to be good. Well, here we go again everyone... I hope you're all ready. Is this really marketing itself as a tearjerker? As if that's anything hard to do. Definitely hyped and looking forward to watching this! Great to see Anohana’s team working on this project by the way! Some excellent Staff to boot, thisbis going to be a really big thing I’m sure! Hopefully, it won’t be a repeat of the Fireworks Movie. Just a personal opinion but CloverWorks is really turning out to be the next big thing, much like how Wit Studio managed to do despite (formerly) being a subsidiary of Production I.G. By the way, is it just me or is masked female characters slowly becoming a trend? I myself usually have a mask when I’m outside, so it kind of intrigues me on a personal level I suppose. Even in SSSS. Gridman, that masked friend of Rika kind of piqued my interest. Ohh this is good news, also Masayoshi joining again is a treat. No offense but I tend to kinda dislike it when people use the word NTR and Mari Okada... despite the fact that it's not really NTR or at least her writing isn't NTR. even then, White Album 2 exists and that's the definition of an NTR anime so... maybe just me. Cloverworks is doing better than A-1 this year. i said "Ntr vibes" and not "Ntr"
Hello upcoming emotional romance movie! Anime girl chilling on the roof of a car is a nice eyecatch ngl. Way to early to judge for me, but as someone who liked AnoHana, I'll keep my hopes up. Sad story with most likely a sad ending and ntr, mega pass. So prolific at delivering this kind of schlock. Now this looks very intriguing...Time to get cucked bois... Oh boi... This will indeed be, not very sad. Well, I didn't like Anohana but Maquia became my favorite standalone movie last year, it's too early to see which of the two directions it will go, but I'm definitely excited! Another Okada Mari x Nagai Tatsuyuki film? I'm up for it. Anthem of the heart wasn't a particularly great movie but it was pretty solid. Just hope this doesn't waste too much time with the 2 hours it's going to be given. I'm a simple man. I see Okada Mari writing script for a series, I hype. Oh boy they're back. Looking forward to it.